Hiking is one of the most popular activities among visitors to the Philippines. The country’s stunning landscape offers a wealth of trekking sites, each with its own unique flavor. Most treks are perfectly safe, and can be done within a reasonable budget, as long as you plan well and use expert’s advice. We offer affordable hiking day tours, as well as excursions lasting a few days. All hiking packages include a personal tour guide – a local who is familiar with the specific area you choose. We also take care of transports and hotels, and can even provide camping gear if needed. There are literally thousands of great hiking sites in the Philippines, found at practically all different destinations. No matter where you choose to spend your vacation, we can help you experience the beauty of nature. Below, you can find the best hiking sites at the most popular tourist destinations. We offer a solid mix between easy, family-oriented hikes and challenging mountain climbs taking a few days – so you will surely find what you like. Although Manila is a densely populated metropolitan, it also offers a wide selection of beautiful locations. Many sites are just a few hours away from the city, some of which are among the best in the Philippines. Mt.Manalmon is just 2 hours away from Manila, and the perfect hiking spots for beginners. The hike doesn’t take longer than 2-3 hours, and its a truly marvelous one. You’ll be going through the dense forest up the river’s stream until you reach the mountain’s peak and get a stunning view of the whole Bulacan area. 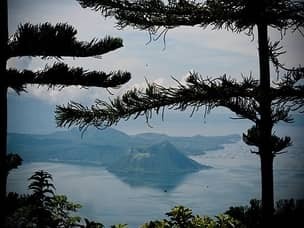 Another extremely popular location, merely 2 hours from Manila, is the Taal volcano trail. This is also best for beginners, as it only takes 40 minutes to reach the summit of this small volcano, then another 40 to descend to the crater’s lake, where you can take a swim if you feel like it. The views at Taal volcano are simply spectacular, so any nature lover should strongly consider adding this tour to his Manila itinerary. 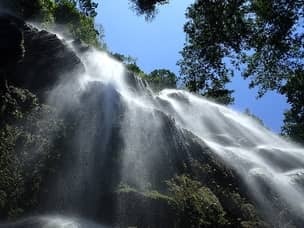 You will find the Ambon-Ambon falls near the western coast of Taal lake. It takes 30 minutes to reach the falls and the scenery is stunning – walking along streams deep in the jungle. Sadly, the swimming pool created by the falls at the lower level is now closed, so one would have to go up to the second level in order to swim. Still – its well worth a visit and its a refreshing stop for your Taal volcano day tour. Mt.Pinatubo is another great hiking site you should seriously consider. The climb to the top is slightly more difficult, and takes roughly 3 hours (1 hour 4×4 and then 2 hours trek) – but still appropriate for novices and even families. The climb is well worth it though, as the view at the top is simply amazing. The volcano’s last violent activity in 1991 was the 2nd largest terrestrial eruption of the 20th century, and has created a magnificent crater lake as well as altering the entire landscape. Many tourist arriving to Manila take the 140km drive to Puerto Galera mainly in search of the beautiful beaches and world-class diving spots available there. Puerto Galera is one of the most popular tourist destinations in the Philippines, and also offers great hiking spots for nature lovers. Tall mountains, filled with jungles and hidden waterfalls, surround the beach areas. Our Puerto Galera hiking day tour takes you across the entire mountain trail, and offers a truly amazing opportunity to experience the local nature and wildlife firsthand. Palawan is the best island in the world for good reason – it has much more to offer its visitors than just stunning white beaches and fantastic diving spots. It is a great destination for hiking, with lots of different exciting day tours available. Also, what’s better than ending your long day by relaxing at one of the numerous luxurious resorts found on the island. The whole island is covered with mountains filled with lush jungle and bristling with wildlife and activity. The easier hikes, which can be accomplished as day tours, are found near the provincial capital of Puerto Princesa. Mt.Magarwak and Mt.Beaufort offer amazing hikes that are safe for beginners but still full of fun and adventure. 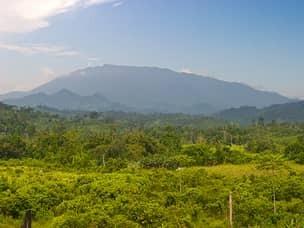 Mt.Bloomfield, also in the vicinity of Puerto Princesa, is a bit more challenging and climbing to its peak would most likely take your entire day. Cleopatra’s needle is also near Puerto Princesa, and is one of the most famous landmarks in the island. The trail to the top is rich with wildlife, and the view from the top is truly spectacular. The trek takes, however, 3-4 days to complete and so it is not ideal for inexperienced climbers. We will gladly help you by providing a personal guide and camping gear, as well as free advice on how to stay safe and have the best possible time. 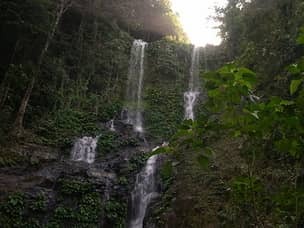 Another great option for a day hike are the Nagkalit-kalit falls. Found not far from the beaches of El-Nido, reaching the falls requires just a 45 minutes hike through the jungles. It’s a perfect day tour for couples and families, and the pool waiting at the site is very refreshing. The falls themselves are certainly beautiful, but underwhelming compared to other waterfalls in the Philippines. 20km from the main tourist spots lies Narra, home to some of the best hiking spots. Over there you will find Sultan’s peak – Palawan’s highest peak towering at 1215m (3984 ft.). 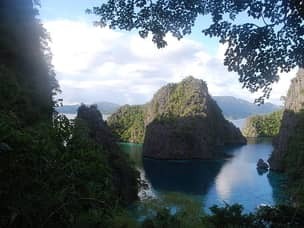 It will take 3-4 days to complete this climb, but the reward is a breathtaking view which overshadows any other hiking spot found at Palawan. Climbing Mt.victoria on the other hand, would still take you no less than a full day, but the climb itself is much less challenging. It offers a good alternative to travelers who can’t afford the 3 days climb. Cebu is one of the most popular destinations in the Philippines and a major gateway to countless beautiful, smaller locations. The city itself offers a wealth of possible activities and high-end accommodation. It’s also a great starting point for day tours in surrounding areas, which include some of the most scenic spots in the whole country. The most popular hike is the climb to Osmeña peak, the highest point in Cebu towering at 1013m high. Osmeña is actually a series of jagged cliffs – a unique landscape often compared to bohol’s chocolate hills, and a stunning view of the entire province. Although relatively high, the hike is quite easy and well suited for beginners and families. For those with some time to spare, we strongly recommend spending the night at the peak’s campsite. You could watch the sunrise, then make your way down towards Kawasan falls, another magnificent landmark located nearby. When in Cebu, you should certainly pay Moalboal a visit. This hidden gem is one of the best diving spots in the Philippines. Moalboal is also a great starting point to one of the more challenging and rewarding day hikes in the Cebu area – the trek to the Twin lakes. Also reachable from Dumaguete, the Twin lakes are actually craters created by volcanic eruption. You will have to endure 6 hours of jungle trekking, but the view along the way is breathtaking. Its a great way to experience the Philippines rural areas filled with friendly locals, rich wildlife and nature. Bohol is very close to Cebu and easy to reach by ferry or flight. Its also one of the most popular places for tourists, seeking its beautiful beaches and carnival-like atmosphere all year round. Bohol is also home to the famous Chocolate hills – a one of a kind hill formation that makes a great site for day hikes and ATV rides for the whole family. You can read all about the Chocolate hills and everything else in the area in our detailed Bohol guide. Another great location not far from Cebu is Camiguin island – a jungle filled island created by a volcanic eruption. Camiguin is one of the best spot for nature lovers. The main attraction here is the active volcano Mt.Hibok-Hibok (1332m). Climbing to its peak takes roughly 4 hours. The volcano’s peak offers a stunning view of the entire island, as well as nearby islands such as Bohol, Siquijor and Surigao. Camiguin is also a great place to do some jungle trekking as its dense forests are full with exotic wildlife. There are several proper hotels and resorts on the island, but if you are looking for the full authentic experience, consider camping at one of its beautiful secluded beaches. Best season : Summer in the Philippines is between March and May, and tempratures could be quite high. The best time to hike is January to February – when its still a bit cooler and less humid. Safety : Once you select your desired destinations, be sure to read as much you can, learn about each and come prepared. We keep track of travel warnings and weather changes, so drop us a mail to avoid any unpleasant surprises. Guided tours or alone? : All of the tours featured here are perfectly safe and can be done alone without the help of a local guide. It is, however, not recommend unless you are very experienced in trekking and mountain climbing. We offer personal guides as part of our packages and day tours, and strongly suggest you take advantage of that service. Equipment and gear : It is generally better if you bring and use your own hiking or camping gear. Don’t count on locals guide to provide it for you unless specifically mentioned! You can find equipment in most destinations – so if you are missing something just drop us a line. Clothing : the weather is warm, so dress accordingly. There’s no need for any special attire, just make sure you wear comfortable shoes. How to join a group? : We offer group tours at all the popular tourist destinations. Part of our unique service also includes finding suitable companions for your desired trip. If you can’t find your favorite location in our groups packages catalog, just mail us. Hiking with others is a great way to make new friends and have a lot more fun! How to create the perfect hiking vacation? Our agency specializes in creating tailor-made packages to suit your personal needs and expectations. Our unique service ensures you get the most out of your vacation, without needing to compromise. Let us build your entire travel itinerary, and we promise to do so in the best possible way. We will make sure you save both time and money, while still enjoying the perfect vacation you deserve. Our hiking packages include transportation, accommodation and guided tours and can be easily customized to fit your specific expectations. Simply add or remove any item from your cart, and we will find a way to organize your holiday accordingly. We always put our customers first, and encourage you to contact us at any point with any questions or feedback. Our team of experts will gladly assist you with planning your vacation, as well as offer free advice on specific hiking and camping spots you might be interested in. Hi. I will be in Cebu in late January 2019. We are a family of 3. Our son is 7 years old. We are interested in visiting Inmbakan Falls and Osenma Peak. Our hotel will be located in Mactan. Is it possible to do a day trip to these two places and how much will it cost? We are open to joining a group tour with other families or other people. If not, how much would a car and driver cost us for a day to these places? Everything is possible but the hike up osmena peak is a full day trek so better to split into 2 days. Please email us and include your phone number, and an agent will help you figure everything out. I am looking for a multiday expedition in late November to earl December with long hiking days for a solo traveller – do you have anything available? We offer such expeditions in most of the destinations we work in. 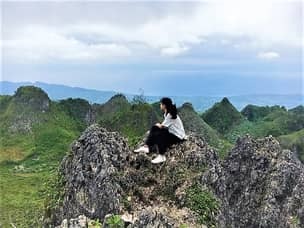 Personally, i think the best value to be have is by doing the Banaue 3 days trek, or the jungle treks in Cebu so check those out and let us know if it seems interesting.